The Great Red Spot is a very long-lived spinning vortex: drawings show the GRS in the Victorian era, but it might have persisted for even longer than that – even Robert Hooke’s and Giovanni Cassini’s 17th century observations suggest a feature at this particular latitude, so it might have been around for almost four centuries. 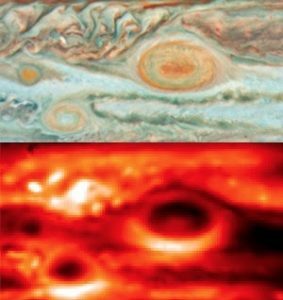 Comparing Hubble imaging of Jupiter’s storms to thermal-infrared observations from ESO’s Very Large Telescope in 2006. The Great Red Spot appears to roll like a ball-bearing between two of Jupiter’s colourful cloud bands: the brown South Equatorial Belt and the white South Tropical Zone. The westward jet that separates these two bands is deflected northwards around the vortex making the storm rotate anticlockwise, meeting the eastward equatorial jet and causing lots of turbulent, chaotic structures to the northwest of the storm. If you were on a balloon at the edge of the swirling storm, you’d be blown around the vortex in about 3.5 days. Of course, you’d need to find a way to be lighter than hydrogen and helium to float, but the anticlockwise winds would mean that you’d be blown around the swirling maelstrom – what a view that would be! The Great Red Spot has been shrinking: We’ve known this for many years, as the size measured by Earth-based and space-based observers (including the Hubble Space Telescope) has been tracked over time. Voyager measured a width of 25000 km in 1979, but that’s now decreased to as small as 15000 km. But the shrinking is not continuous – it went through a period of rapid shrinkage in 2012-2014, but has now appeared to stabilise at the new smaller size. Who knows whether we’ll ever witness the death of the spot. The Great Red Spot consumes smaller storms: smaller storm plumes, vortices and storm clusters moving along Jupiter’s jet streams can be seen being engulfed by the storm. Maybe this provides the extra energy and angular momentum needed to sustain this swirling anticyclone. The Great Red Spot is cold: At the cloud-tops the Great Red Spot is cold because air is rising within the vortex, expanding and cooling down. This cooling causes gases to condense, creating the thick cloud cover high over the GRS. The Great Red Spot has a warm cyclonic heart: Thermal infrared images show a warm core to the cold vortex, and this warm core coincides with the deepest red cloud colours, and possibly a stagnation of the winds. Is this the core of the vortex? The Great Red Spot is not quite the same as a hurricane: There’s no ocean beneath to sustain the energy of the GRS, and no one truly knows how far down the GRS extends into the deep atmosphere (is it deep or shallow)? That’s one of the things that Juno could show us. We still don’t know why it’s red: There’s no distinct spectral signature for the aerosols causing the red colouration, but we think it is related to sunlight breaking down the chemical bonds of materials dredged up by the upwelling in the storm. These chemically-altered species might contain sulphur and phosphorus, which can lead to the red colours. Juno will be closer to the Great Red Spot than ever before on July 11th 2017: Juno is due to fly about 9000 km above the centre of the Great Red Spot (GRS) on Monday night, about 12 minutes after its closest approach to the planet on July 11 at 01:55 UT.